Do you ever have one of those meals that just sticks in your mind days and days after you’ve eaten it because it was juuuuusst soooooooo gooooood? Of course you do. Because you love food, like me. You are my people. Welp, that happened to me most recently with a chicken and gyro shawarma pita sandwich. THIS pita sandwich, to be exact. Right? Right?? Even looking at it makes me weak in the knees. So obviously my natural reaction was to recreate this beauty in my own kitchen as soon as humanly possible. Unfortunately that was a whole week later and it was torturous, BUT — the end result was fantastic. And I’m so jazzed to share it with you. This is actually just a recipe for the heavenly soft pita flatbread that envelops the Greek/Mediterranean fillings like a warm pillow of carby deliciousness — I’m leaving the fillings up to you, because I’m sure you have your favorites. But in case you need assistance, we went the veg route with lots o’ crispy lettuce, chopped tomatoes and cucumbers, salty Kalamata olives and crumbly Feta cheese and a ranch drizzle (because yours truly was too lazy (read: too eager to eat already) to make tzatziki sauce… but next time these recipes are so happening). Alllll on a homemade soft flatbread. Mmmhmm. But now I’m also dreaming of other fillings, like grilled chicken, or steak with ooey-gooey melty cheese, or garlicky hummus, or even PB and berries for breakfast… really, anything and everything so I can eat as many soft flatbreads in a 24-hour period as possible. It’s a new life goal. Like English muffins, you make these flatbreads on a griddle, which I kind of love because it’s quick and easy and results in fresh, warm flatbreads you can eat IMMEDIATELY. Applause. The dough comes together in lickety-split, you let it rise, then you roll it out into flatbread form and cook it and that’s it and that’s all, friends. Commence the eating. A few notes: I added a bit of whole wheat flour to my recipe for the health, but you can use all bread flour if that’s all you have/all you want. I really love using my griddle for this recipe because a) I can control the temperature better and b) I can cook two flatbreads at a time, as opposed to one at a time in a skillet. When you cook the flatbreads, make sure the temperature is hot enough so that they cook on each side for not much longer than 3 minutes; otherwise, they might dry out and therefore not be so soft. And finally, it’s best to eat these flatbreads the day they’re made (not that that will be a problem), but you can also store them covered at room temperature for up to a couple days before they start to dry out. Just be sure to nuke them for a few seconds to soften them up again. Warm Greek sandwich made with homemade flatbread = I’d contest there is nothing better. In a large bowl or bowl of a stand mixer, dissolve yeast and sugar in warm water. Let sit 5 minutes until foamy. Add 1 cup bread flour, whole wheat flour, salt, milk and olive oil. Stir until just combined. On a floured surface, knead dough 10 minutes by hand, adding just enough of the remaining 1 cup bread flour needed to make a soft, smooth and only slightly sticky dough. OR, using dough hook attachment, knead dough in stand mixer 5 minutes, adding just enough of the remaining 1 cup bread flour needed to make a soft, smooth and only slightly sticky dough that pulls away from the sides of the bowl. Shape dough into a ball and place in a large, lightly greased bowl; turn once to coat. Cover bowl with plastic wrap and let dough rise in a warm place 1 hour until doubled. Meanwhile, heat a griddle or large skillet to 350 degrees F, or medium heat. 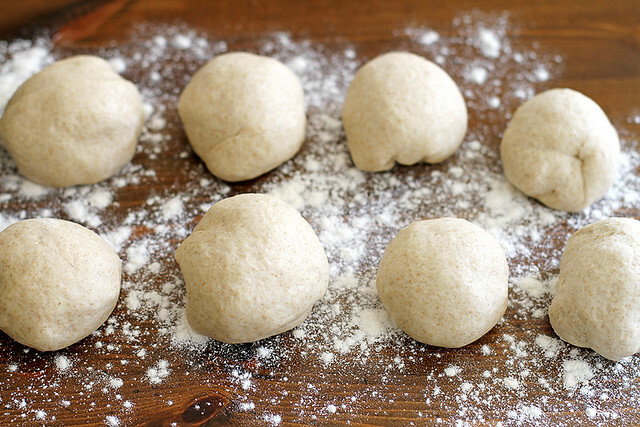 Punch down risen dough and divide into 8 equal pieces. Shape each piece into a ball and place on a lightly floured surface. Cover with a thin towel or plastic wrap and let rest 10-15 minutes so the gluten has time to relax. Working with 1 piece of dough at a time, roll out dough to an 1/8-inch thick circle, about 7 to 8 inches long. Place the flatbread (1-2 at a time, depending on how many fit on your griddle/skillet) on the griddle or skillet and cook 2 to 3 minutes until top begins to get bubbly and puffy. Use tongs to flip over and cook on the other side, another 2 to 3 minutes until golden brown spots appear on the bottom and the flatbread is cooked through. 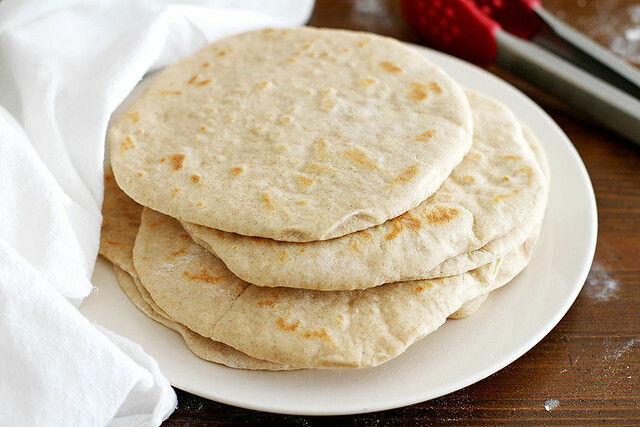 Stack cooked flatbreads on a plate covered with a towel while you cook the remaining flatbreads. Serve the flatbreads immediately, or reheat them as needed to make them soft again. Store flatbreads, covered with plastic wrap or a thin towel, at room temperature for up to 2 days. Holy smokes!! This is the kind of flatbread that can seriously go with anything. Love! Yum! Bread of any kind is good but I am sucker for flat bread! The softness always gets my tummy rumbling. Love that this uses whole wheat flour and bread flour — that combination is delicious. 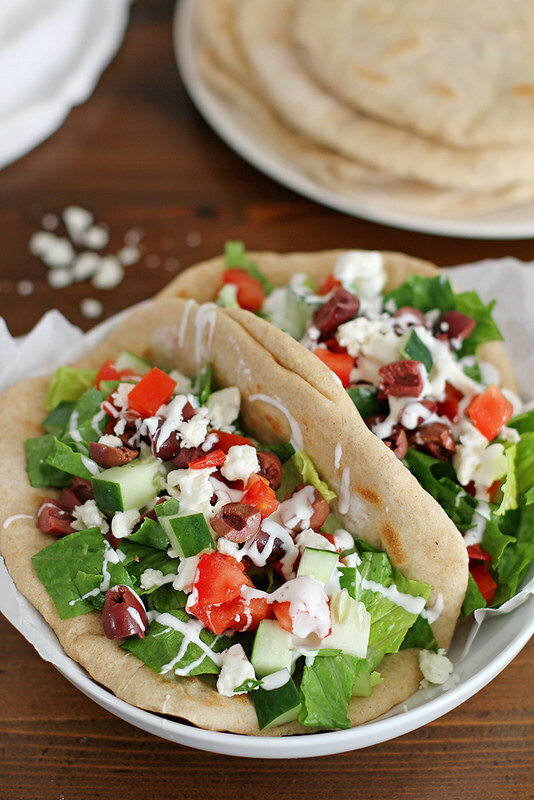 I’ve been putting off making pitas waiting for a recipe like this! Now, I have no excuse not to try it. Thanks for what looks like an amazing recipe. That sort of thing happens to me all the time and I love it when I can recreate those meals at home. Love these, Stephanie! Oh my, I can’t wait to try this! I’m opting for eggplant and peppers with some tzatziki! I adore flatbread. These look perfect! YAAAAAS. I want to reach into my computer screen and grab one of those gorgeous flatbreads! I’ve been dying to make this chicken souvlaki recipe from work, and these will be perfect with it! It’s so hard to find nice flatbreads like this. I’ve never made homemade flatbread, but this recipe looks totally approachable! I really want to try it out. These look so gloriously fluffy! I’ve been on a huge Mediterranean kick lately (started with a kafta dish at a Mediterranean restaurant), so I’ll definitely need to be adding these flatbreads to my life sooner rather than later! Oh my!! U mean I won’t be a slave to the chicken sharwama I eat weekly from this place anymore? Love these flatbreads! Thank you SO much for sharing this recipe! I’m one of those people who will just eat the warm flatbread or homemade tortillas on the side, sans filling. These look delicious! Sune — YUM. Love that idea! girrrrl this looks amazing. i have been craving a nice doughy pita falafel/gyro/shawarma situation…. Ooof! I want to make all the flat bread-y things with this!! 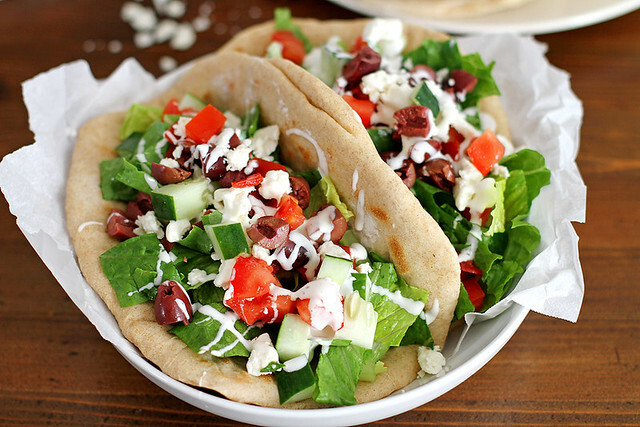 Those Greek salad pitas look fabulous and so perfect for this hot summer weather! I do not make bread often enough (er… ever). Love these little flatbreads! These will be making an appearance in my kitchen soon! Love flatbread! Oh my goodness, these are happening tomorrow. The sandwich looks amazing Stephanie!! And the bread looks lovely and soft!! These look like pure carb heaven! Jessica — Yay! Hope you like them! Now I want flatbread. And shawarma. And it’s 7am….drool! Delightful. Cannot stand how delicious they look. Honest, I could die! My husband has a thing for homemade flatbread. I used to make it all the time – had this yummy recipe that wasn’t too tough to make. I haven’t made it in years – (like close to 10!) and he STILL asks for it! Well, I’m making flatbread soon — but it’s going to be this recipe! What a gorgeous flatbread that could serve as the base of so many incredible recipes. Thank you for sharing! I will talk about a great meal for MONTHS afterwards. Love that you relived it at home! Love, love, love a good flatbread. Made these tonight on the spur of the moment. So easy and quick to make (well, as quick as you can get with a yeast dough) and they tasted fabulous just off the griddle. Robin — So glad you liked them (and it’s awesome that you can eat them right off the griddle, right? ;))! Hey just a note that this says 30 mins prep time but you say to leave the dough to rise an hour. Just thought I’d mention. I’m making these tonight with chicken on the grill! Can’t wait! This recipe sounds so fantastic, thank you! 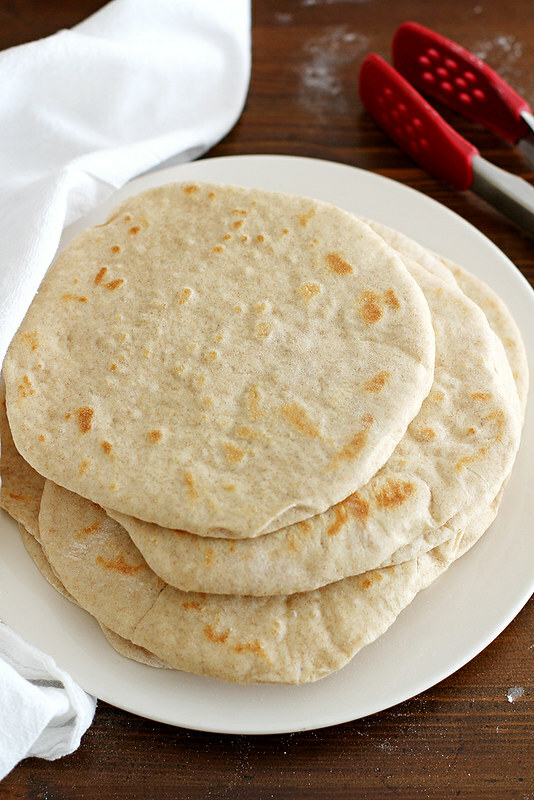 My fiance requested this exact kind of soft pita bread, and I wasn’t sure that I would be able to find the right kind of recipe. I have one question for you. I don’t know that I will have time to prepare everything all at once, but I would really prefer to be able to serve them right after cooking them (rather than reheating). 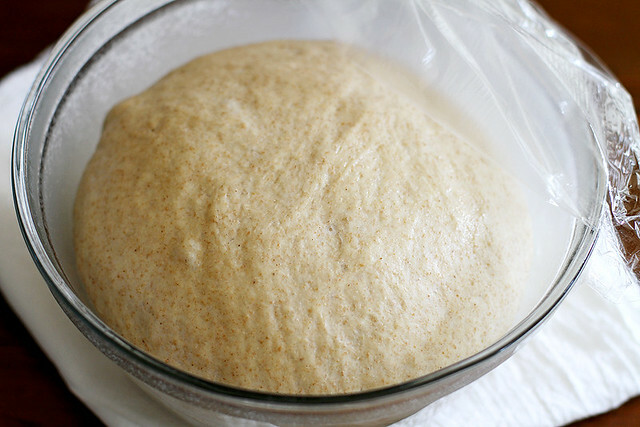 Do you think there is any point when the dough could be put in the fridge overnight? Do you think that would be best before or after the rise? Thank you!! Jen — I’ve never chilled the dough so I can’t say for sure it will work, but you can try to let it go through the first rise, then punch it down, shape it into a ball again and place it back in the bowl, covered, and let it sit overnight in the fridge. The next morning, just be sure to let it warm up to almost room temperature before proceeding with the recipe. Hope that helps! And enjoy (both of you ;))! Thank you for your suggestion! I put it in the fridge overnight after the first rise, and then separated into balls fresh out of the fridge. I left them covered until they were back to room temp, and then started rolling them out. They worked perfectly! I found your recipe the other evening when I ran out of flatbread…unfortunately I did not have all the ingredients on hand. Today, while shopping, no one had any of the commercially prepared flatbread I usually buy in stock, so I tried your recipe. OMG. I can honestly say I will never buy it again. It was so easy to make and it is delicious. Most of all, it is SOFT, which makes it perfect! Thank you for sharing this! Need to adjust time. I got all the ingredients thinking I could make this for dinner, right? I needed 40 minutes. Nope. Dough comes together in 15 min. Needs an hour to rise, then 10 minutes to rest. Total cook time is at least double. This couldn’t have come at a better time! Trying out your recipe now for #souvlakisunday! So do you use 3 cups of bread flour if you are not going to use the 1 cup whole wheat flour? Sandra — Yes, that is correct! Please can you give a weight for ingredients, not a vague volume? Vf — It’s a standard American measurement for a cup. 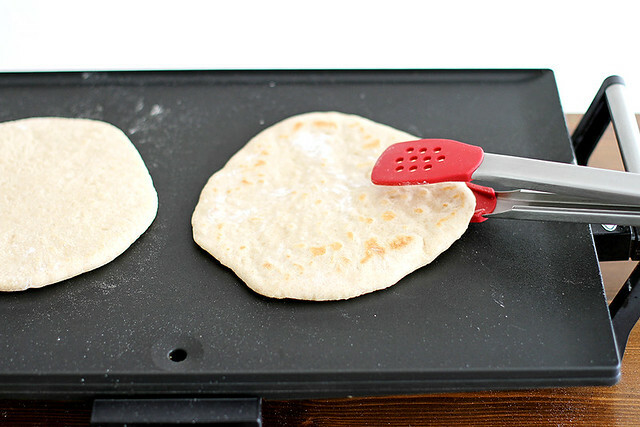 I never thought of using a skillet to cook the flat bread, that makes a lot of sense! I have a big family so it definitely would be much better to cook a couple at a time rather than one. I’m pretty much a menace in the kitchen so if I can’t seem to get the recipe right, I get some from the store. Thanks for sharing this, I can’t wait to give it a try! Looks good! I don’t like wheat flour can I use regular flour will it turn out good? Has anyone tried making this gluten free? If so, what flours did you use? If you roll it out, doesn’t that deflate the dough and you lose all of the risen dough from the CO2 action? Jay, though I haven’t made this recipe yet, but I will!, I read a similar recipe, that said to use your hands, fingers, to shape the dough. Could you consider adjusting the total time? I started the recipe without reading the rest thinking it would only take 40 minutes total and it turns out closer to two hours with the rising and cooking.